The American Legion passed more than 300 resolutions at the 98th National Convention in Cincinnati last August, but one drew more attention than others. The Legion’s TBI/PTSD Committee, led by Past National Commander William Detweiler, proposed a resolution through the Convention Committee on Veterans Affairs & Rehabilitation supporting research of medical marijuana as an alternative treatment for veterans suffering from combat-related mental health disorders. Schedule I drugs – which include heroin, LSD and marijuana – are considered by the DEA to have no medical benefits and strong potential for abuse. Thus, by changing the category, marijuana could be studied by scientists for its healing properties and not solely for negative effects. Five years ago, the Legion established the TBI/PTSD Committee to evaluate the treatments and challenges veterans face when suffering from conditions often described as the “signature wounds” from the war on terrorism. “Our interest is to determine what treatments are being employed by (VA and DoD) currently and what other treatments and protocols may be available that are not being currently used and/or approved,” Detweiler said. Since the resolution passed, Detweiler has received multiple requests for media interviews. In them, he is routinely asked why a veterans organization is asking Congress to change marijuana from a Schedule I drug to a category with less control. Every time, Detweiler reiterates that The American Legion is only interested in the care of veterans and exploring all treatments that might help them. With that in mind, the Legion invited Dr. Sue Sisley, a medical cannabis researcher, to speak about her experience and proposed research study prior to the national convention’s vote on the resolution. As a doctor trained in psychiatry and internal medicine, Sisley has been treating veterans for more than 20 years at her Arizona-based practice. In April, Sisley received approval to conduct a two-phase study of more than 70 veterans in various locations, utilizing three different strains of marijuana and a placebo. She believes the study will yield specific data that will hold up against challenges because it relies on concrete numbers. Noting that she has never personally used marijuana, Sisley says she understands the stigma attached to the drug. She was skeptical it could be used as treatment for PTSD until several of her patients disclosed their personal use and how much it helped them with their symptoms. But the more Sisley talked to veterans and their family members, she concluded that the use of cannabis deserves at least a study in a controlled environment to gain scientific data. In 1996, California became the first state to legalize marijuana for medical use. Currently, 25 states, the District of Columbia, Guam and Puerto Rico have followed suit and enacted medical marijuana programs. Though half the country has legalized the drug for medical use, Sisley says there is a shortage of scientific studies evaluating its health benefits. In fact, there has never been a single randomized, controlled trial here, leaving a crucial void. Iraq veteran and Legionnaire Roberto Pickering says he doesn’t need a study to believe in the health benefits. 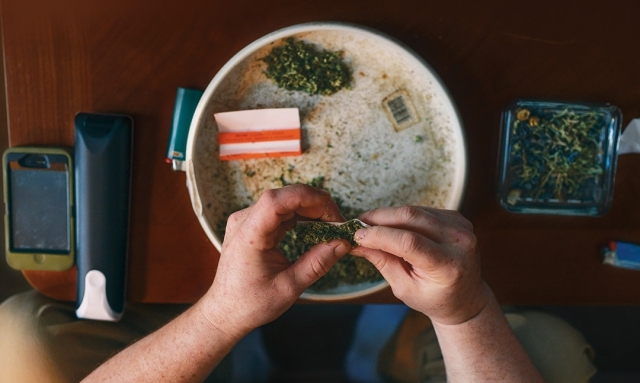 As a 100-percent PTSD-disabled veteran, Pickering says that medical cannabis saved his life. Pickering served in the Marine Corps infantry from 2003 to 2011 and was part of the invasion of Iraq in 2003. He currently lives with his family in California, where medical marijuana is legal. It’s one Pickering has witnessed firsthand. He says he has lost two fellow Marines to alcoholism and an opioid overdose, and wants to help others who have served their country. In addition to supporting Sisley’s efforts, Pickering established the Battlefield Foundation, a suicide-prevention campaign for non-opiate-based relief through cannabis therapies. Though young, it provides emotional support, medical help and economic empowerment for veterans suffering from PTSD. Eventually, Pickering would like to see the foundation help veterans secure jobs in the medical cannabis industry while providing the medicine that’s helping them and their comrades. He believes medical marijuana is a potentially revolutionary treatment, as well as a way to bridge the gap between older and younger Legionnaires. He applauds the organization for passing a resolution to lift restrictions that would allow for the health benefits of cannabis to be better explored. Ultimately, research on medical cannabis should provide more information for veterans and medical professionals to determine the best treatment for each individual, Pickering says. At least, that’s the perspective of a veteran who’s still fighting the battle. Stacy Gault is assistant media relations manager for The American Legion.